If this is part of Redmond's alleged scheme to steal the Mac's look, it's got the wrong idea. Microsoft has announced plans to peddle Windows 7 desktop space to advertisers, who'll create Windows UI themes--customized backgrounds, audio clips, and other elements--that highlight their brand, Computerworld reports. 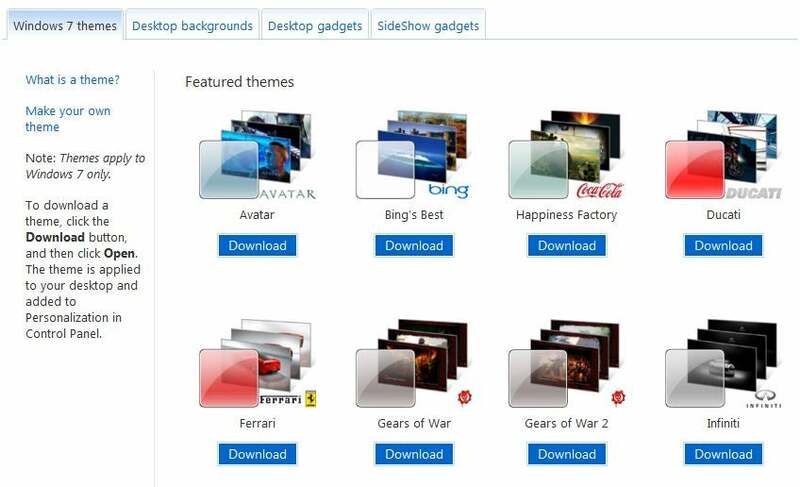 In fact, some advertiser themes are already available in the Windows 7 Personalization Gallery, including desktop pitches for soft drinks (Coca-Cola, Pepsi), autos (Ducati, Ferrari, Infiniti), and big-budget Hollywood blockbusters (Avatar). Ad-themed desktops are new for Microsoft, which has long allowed PC manufacturers to customize the desktop. Hardware vendors like Acer, Dell, HP, and Sony often muck up the Windows UI with background logos and countless icons for trial apps and other crapware. (Those trial apps provide an additional revenue stream, an ugly necessity in the low-margin world of Windows PCs.) Too often the hardware guys' appalling makeover turns an aesthetically appealing UI into a tacky swap meet. The advertiser themes are different, however, in that they won't be foisted on unsuspecting users. Rather, you'll have to download and install the ad pitch yourself. As a result, I doubt many Windows 7 users will gripe about ad themes. Hey, if you're a Preparation H fan, why not devote the desktop to your favorite ointment? Nevertheless, I think ad themes are a bad idea. They may boost Microsoft's bottom line a bit, but they run counter to Redmond's grand scheme of creating an elegant Windows 7 experience. Microsoft may have refuted the claims of its blabbermouth employee who told a British publication that Windows 7 cribbed its sleek appearance from Mac OS X. (Bad career move there.) But any casual observer can tell that Windows has borrowed more than a few UI concepts from Apple over the years. I don't see why things would change now. Redmond's situation is complex. Unlike Apple, it doesn't control the entire Windows ecosphere. It makes the software but not the hardware. Consumers typically obtain Windows via a third party--the the PC vendor, which works its toxic voodoo on the desktop. Furthermore, Microsoft and its OEM partners don't enjoy Apple's generous profit margins, and therefore must find creative ways to boost revenues. If Microsoft truly wants a Mac-like experience for Windows 7 users, it should lock down the desktop. Non-commercial themes are OK, but tacky ads, movie promos, and other cheese ball garbage must go. To paraphrase Ron Burgundy: Keep it classy, Microsoft.